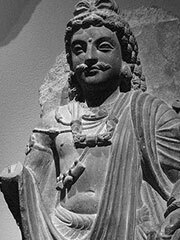 Mahadhammarakkhita (Sanskrit: Mahadharmaraksita) was a Greek (in Pali:»Yona», lit. «Ionian») Buddhist master, who lived during the 2nd century BCE during the reign of the Indo-Greek king Menander. In the Mahavamsa, a key Pali historical text, he is recorded as having travelled from “Alasandra” (thought to be Alexandria-of-the-Caucasus, around 150 kilometers north of today’s Kabul), with 30,000 monks for the dedication ceremony of the Maha Thupa («Great stupa«) at Anuradhapura in Sri Lanka, when it was completed shortly after the death of the Sri Lankan king Dutthagamani Abhaya (r. 161- 137 BCE). Alexandria of the Caucasus, a city under the control of the Greek king Menander, had a Buddhist monk population of possibly as many as 30.000, indicating a flourishing Buddhist culture under the Greeks. The head of this Buddhist community was a Greek (Yona) Buddhist elder named Mahadhammarakkhita, indicating the direct involvement of Greeks in the development of the faith, in the northwestern part of the Indian subcontinent. They were able to travel unhindered south as far as Sri Lanka, indicating some kind of stable political situation along the west coast of the Indian subcontinent, especially at a time when the Sunga Empire in the east was persecuting Buddhists. It is also separately established through another text, the Milinda Panha, and archeological evidence that Menander himself ruled a vast empire in northern India, and that he became a Buddhist arhat. According to Buddhist tradition he was a great benefactor of the Buddhist faith, on a par with Ashoka or the Kushan Kanishka. These elements tend to indicate the importance of Buddhism within Greek communities in northwestern India, and the prominent role Greeks probably played in developpig the Buddhist faith during its first few formative centuries.